Two exhibitions about Isotype are currently on at the University. Both draw on materials in the Otto and Marie Neurath Isotype Collection. This compact exhibition, assembled by Christopher Burke and Matthew Eve, includes highlights of Isotype work from the 1930s and 1940s, including publications about British social progress and the new Beveridge Plan, and books that functioned as propaganda for British wartime alliances with the United States and the Soviet Union. 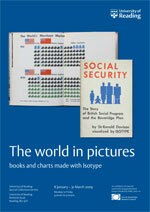 Otto and Marie Neurath began working on Isotype books for children in the 1940s. 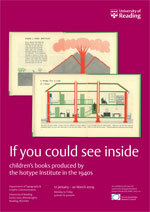 Between 1947 and the late 1960s the Isotype Institute produced numerous books in series including the 'Visual history of mankind', 'Wonders of the modern world', 'Visual science', 'The wonder world of nature', and 'They lived like this'. Originally published in English, many were translated into other languages including German, Japanese, French, Danish, and Italian. This exhibition, assembled by Sue Walker with assistance from Emma Minns, surveys examples from the 1940s and includes a rich selection of preparatory materials together with the published books themselves.